This elegy was originally published in Binet’s memorial volume, Discours de la Vie de Pierre de Ronsard, in 1586. It was picked up and anthologised in 1778, in volume 8 of the Annales poétiques, ou Almanach des Muses, after which it reappeared several times elsewhere, copied from that anthology,and can now be found in several places on the web. But the 1778 anthologisers quietly abbreviated Garnier’s text – removing approximately 50% of it! So the versions found elsewhere are likewise abbreviated and I think this is the first time the full original text has been reproduced online. Qui souffrent tant de maux. On ne la craindroit tant. Sans se gesner de soing. La vertu pour le gain. Et voila nostre vie, ô miserables hommes ! Nous la pille aussi tost. Durent [orig : durant] presque toujours. D’où jamais on ne sort. La plume et le papier. Qui ne changent de cours ? Par un sort rigoureux ? Qui le chantoit si haut ? Qui dira ses combats ? ses batailles sanglantes ? Aux plaines de Poictou ? Et la manne du ciel. Comme on faisait jadis ? Meurt le jour mile fois. Pleure le long de l’an. Than the event itself will be. We would not be so frightened of it. Without troubling themselves with worries. Bubble away in our hearts. And that’s our life, o wretched men! Steals it from us soon enough. From which none ever escapes. That we may pass to the other side. Which don’t change their course? Which break and break again? Who sang it so loudly? Who shall sing of his combats? Of his bloody battles? Only in the praise of God. To sing of his worth. As they did in the past? Die a thousand times every day. To crown you with them. – verse 55-56 list many of the greatest poets of the past, legendary and historical. 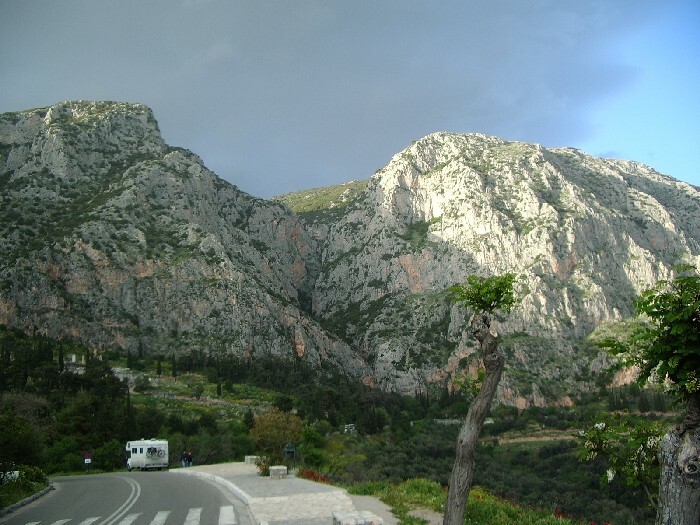 – the “Theban praise-singer” is Hesiod, associated with Mt. Helicon in Boeotia. Bringing us from legendary to historical poets, “the poet of Mantua” is Virgil and the “Latin lyricist” is Horace. Seneca, although we think of him as Roman, was indeed born in Spain, in Cordoba; and last in the list and the only ‘modern’, the love-poet from Florence is of course Petrarch. Qui croistront à l’envy de l’escorce nouvelle. Que l’Esté ne la brusle, et l’Hyver ne la gelle. Dy, Ce Pin est sacré, c’est la plante d’Helene. Which will get bigger despite the new bark. So that summer does not burn nor winter freeze it. Nothing very radical here, one might think, though the presence of fauns on the Loir is unusual and a reminder that, for Ronsard, classical mythology was not confined to the Greek landscape – the deities and heroes were also very present for him in his contemporary landscape. L’honneur de son travail ne luy est point donné. Que d’un si petit lieu tel Poëte soit né. « Apres qu’il est absent, chacun le pense un Dieu. « Et la posterité rend l’honneur sans envie. The honour due his work is never given to him. That from so small a place was such a poet born. After he is gone, everyone thinks him a god. A gently-classicising poem to end book 2 as originally conceived. The black river in line 3 is the Styx, the border of the underworld; Permessus in line 6 is the spring on Mt Helicon, home of the Muses. Both do not demand great learning from Marie! 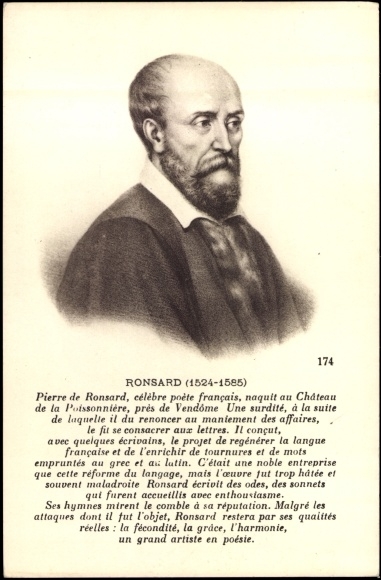 Ronsard remains full of certainty about his eventual acceptance as France’s pre-eminent poet…! L’honneur que l’on te doit ne te sera donné. Que d’un si petit champ tel poëte soit né. De l’homme, quand il vit, est tousjours odieuse. Après qu’il est absent, chacun le pense un dieu. Et la posterité rend l’honneur sans envie. The honour people owe you will not be given you. That from so small a countryside was such a poet born. And so we reach the end of book 2: merry Christmas! Ou long temps ou jamais par l’âge de ce livre. Contre l’âge croistra vieille en sa nouveauté. Vous monstrer par effect combien vostre je suis. Que tout l’ouvrage entier pour vous ne soit ourdy. Le temple de Ronsard et de sa Marion. Seroient de filets d’or par ondes enlassez. D’Arachne ou de Pallas, couvriroit vostre sein. Respandant par le temple une amoureuse haleine. Droicte sur le sommet d’un pillier venerable. Qu’en fin en vostre amour vous trouverez mocqueur. Et luy-mesme se puisse à luy-mesme desplaire. Un Carquois tout chargé de flames et de traits. Comme les nouveaux Dieux des fidelles amours. Lors qu’ils se font l’amour de la bouche et des ailes. Et tout chargé de fleurs s’en iroit à sa mere. Les jeux que fit Ronsard pour sa belle Marie. Où tousjours l’amoureux se voyoit contre-aimé. Vostre nom et le mien et nos tumbes honore. Que je vous ay six ans plus que mon cœur aimee. For a long time or forever, as long as this book lasts. In despite of age will grow old in its novelty. To show you in deed how much I am yours. So that my whole work for you should not be heard. The temple of Ronsard and of his Marion. Would be enlaced in waves with golden fillets. Of Arachne or of Pallas, would cover your breast. Breathing throughout the temple a lovely scent. Right on top of a venerable pillar. And who you’ll fond in the end is deceiving your love. And always displeasing to himself! A quiver filled with flaming darts. Like the new gods of faithful love. When they make love with beaks and wings. And covered in flowers would go home to his mother. The games which Ronsard made for his fair Marie. Your name and mine and honours our tombs. That I have loved you more than my heart for six years. Ronsard in his elegies and longer poems often reminds us that the sixteenth century was a different age: less hurried, perhaps, certainly less concerned to make a point simply and quickly when it can be made several times in different ways! Here as he brings to a close the second book, he allows himself an extravagant classicising dream – a temple of love, statues of himself and Marie as gods of love, a new Olympics based around games of love, … Most importantly, these images are integrated with the evelasting fame Ronsard’s poetry will guarantee them both: Ronsard demonstrates he is hard-headed about fame, not reliant on soft-focus images of classical memorials. Aimed at Marie, the classical references are not complex or profound: Parian marble is a byword for quality now as then; the needlework skills of Arachne and Athene are well-known through the story of their competition which resulted in Arachne the weaver being turned into a spider; the reference to Python situate neatly within a phrase which makes the memory of Apollo’s victory easy to recall, particularly as it is also associated with the Delphic Oracle, most famous of Apollo references; Cytherea a well-known reference to Venus of Cythera; and myrtles are commonly associted with the afterworld. Some references though are odd: cinnamon curls on her head, a lyre mixed in with the military armoury? Maybe I have misunderstood Ronsard’s meanings. I think it likely, however, that Marie’s “virtue” in the third ‘stanza’ has a classical aura to it, implying power as well as virtue in the modern sense. The earlier version printed by Blanchemain has variants scattered throughout, sometimes isolated changes, sometimes larger areas. So, although it makes for a long post, here’s the whole poem again in its earlier incarnation. Ou long temps, ou jamais, par l’âge de ce livre. Contre l’âge croistra, vieille en sa nouveauté. O ma belle Angevine ! ô ma douce Marie ! Dont la vertu me monstre un droit chemin aux cieux ! Vous monstrer par effect le bien que je vous veux. Droicte sur le sommet d’un pilier venerable. Un carquois tout chargé de flammes et de traits. Et tout chargé de fleurs s’en-iroit à sa mere. Qu’on ne void plus icy, leur fut perpetuelle. Vostre nom et le mien et nos tombes honore ! Que je vous ay six ans plus que mon cœur aimée. Show you in deed the good that I wish you. When they make love with beak and wings. It’s worth noting that in this earlier version Marie’s place in the temple is higher than Ronsard’s: he places himself there as an equal in the later version. Blanchemain also includes the four lines beginning “Aux pieds de mon autel…” in parentheses, admitting in a footnote that they were added in the 1584 edition (a quarter-century after the edition he is supposed to be using!). Heureuse saincte et alme Liberté. A tous amans, qu’ils ne m’aillent suyvant. Je veux tuer aux Dieux une Hecatombe. « Belle fin fait qui s’amende en vivant. To all lovers not to follow me. Some fine neologisms from Ronsard, neatly placed by Ronsard so their meaning is inescapable: I love “dé-rheté” in line 4, half a line after the noun appeared. Muret still felt the need to expound its meaning in his notes, though… (Muret also felt the need to explain that ‘vine’ in line 1 is intended as a synonym for ‘bond’.) This poem is also one of Ronsard’s lovely joinings of the classical and the contemporary – here, he’s offering Greek sacrifices (‘hecatomb’ is direct from Homer) in a temple of Liberty, right beside the Loir in France. He also reflects Horace, who memorably wrote of hanging up his lover’s weeds and making way for a more fortunate lover. It’s not obvious that any o the poems around this one – though it comes near the end of the book – mark an end to his love, or liberty from it. But that doesn’t stop it being a fine poem, carefully placed as a fitting classicising farewell to this book of the non-classical sonnets Ronsard had taken up instead of classical odes simply because they were more popular! Pour le bienfait d’avoir sauvé ma vie. For the kindness of having saved my life. Blanchemain also prints the later sestet, though with the dramatic (and classicising) word “macter” (‘slaughter’) for the rather tamer “tuer” in line 13. Pour y fonder ta demeure choisie. Qui peint au vif de ses couleurs ma face. Pleurant ma peine, eschaufferont ta glace. And to found there your chosen home. Which paints my face so vividly with its colours. Weeping for my pain, will warm up your ice. Classical allusiion to the fore again, though here Ronsard’s use of a roundabout way to identify Cassandre is fairly obvious – he rapidly gives us as much information as possible (sister of Paris, daughter of Priam, prophetic mouthpiece of Apollo … ah yes, that would be Cassandra!) In line 3 the “aiguillon” (goad, or prick, or sting, or really anything sharp and painful) perhaps calls to mind a more Christian image, that of St Paul “kicking against the pricks” as the King James version so wonderfully puts it. (Have you ever noticed how many of Jesus’s turns of phrase and stories are the language of a farmer in the fields, not that of a carpenter? If he did follow his father’s trade, he can only have done so part-time!) Whether an intended reference or not, it is clearly the same metaphor: just as cattle were goaded with sharp sticks to keep them from wandering in the wrong direction, so here prophetic knowledge is both painful and also leaves no choice – Cassandra must prophesy, no matter that it hurts. But then, in the rest of the poem, we abandon that image and the pains (or otherwise) of knowledge – because it becomes clear that was all just an elaborate way to say “Cassandre”. There is no real suggestion in the first tercet that Heaven’s guiding is in any way painful to Cassandre, as it was to her Trojan namesake; nor that the need to understand lies behind any decision to move closer to his home. And that is probably why I find this sonnet a bit irritating. There are thematic links between the opening and the rest, but those links seem accidental and un-purposed, which is un-satisfactory in a poet of Ronsard’s quality. Voire y fonder ta demeure choisie. Maybe even founding there your chosen home. Lest it seem I’ve forgotten Ronsard in my enthusiasm for the music, let’s have another sonnet! Perdant noz bleds, les campagnes n’enserre. De sa grand clef les sources ne desserre. Les uns en vent, les autres en riviere. Destroying our sheep, enclose our fields. Of his tempestous waves with his great key. The ones into wind, the others into a river. Ronsard enjoys nature, and shows himself keenly interested in his images of the Loir in particular. I have to say I’m not so taken by the first tercet, which seems a bit weak, but the rest of the poem is less formulaic and far better than a cursory reading might suggest. Aeolus ‘unearths’ the wnids because he keeps them trapped in his cave until releasing them. Strangely, in view of my comments above, it’s the opening that got re-worked by Ronsard! And rather considerably improved, I think. De sa grand’ clef les sources ne desserre. Mon cœur en vent et mes yeux en riviere. My heart change into wind and my eyes into a river.